Our modern workshop is equipped to handle almost any engineering work. We can work in all materials from plastics to stainless steel. If you need something made, large or small, we can do it. Active Engineering’s workshop is the centre of our business. 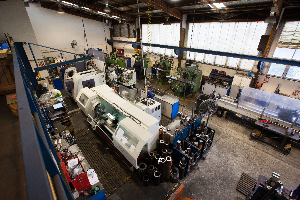 Not only does it provide support to our lineboring, printing and hydraulic operations, the workshop is a busy jobbing shop in its own right, with a constant flow of repairs, maintenance and custom production work for every imaginable industry. We carry a large stock of 4140 black, 4140 CG, IH38 and CK45 chrome bar, as well as New Zealand's largest stock of ActiBush hardened pins, bushes, shims and seals. We rarely have to wait for deliveries from a supplier and our customers know we deliver quick turnaround times. We also keep comprehensive records dating back more than 20 years. As well as providing continuity and protecting our customers' intellectual property, this allows our workshop to reproduce historic projects without having to redesign and redraw components from scratch. We specialise in helping customers with gnarly technical problems that others haven't been able to solve. Because of our experience and our traditional engineering skills we can also produce unusual work, one-offs, prototypes and specials faster and more cost-effectively than others. Active can also carry out jobs with challenging deadlines, and has staff on-call 24/7 for after-hours emergency work. Over the last 20 years we've seen our workshop business change as our customers have changed. Technology has developed and our CNC equipment is now much more advanced than what was available 20 years ago. And whereas years ago many factories would have a maintenance or machinery manager on staff, now our customers are more likely to rely on us to identify and explain their equipment as well as fixing it. We repair all kinds of machinery including presses; gearboxes, conveyors, and drive assemblies; tanks, valves, batching and mixing equipment and hydraulic and pumping/refining systems, as well as general machinery repairs. We can also mill and turn heat-treated material, and provide heat treatment for finished products. Harrison Colchester Magnum 1250 with 2-axis machining, 920mm swing, 3000mm long, 125mm spindle bore. SINOT milling machine with 3-axis machining to 775mm. Harrison Teach Alpha 550T CNC lathe with two-axis machining, 600mm swing, 2500mm long, 100mm spindle bore. Our seven meter ram bed is in a dedicated section of the workshop. It can service rams with up to a four meter stroke, and we have developed specialised tooling to go with it. From our convenient location off Constellation Drive, we provide an onsite workshop maintenance service to a range of clients in the areas of manufacturing, processing, production and other related industries. Find out more about how we've helped our customers. Five fully qualified tradesmen supported by additional staff give us the capacity to produce 480 man hours per week for urgent assignments on our comprehensive and modern machines. Active's workshop team are happy to discuss any engineering or fabrication job. Click on the team photo to learn more about the workshop team members.